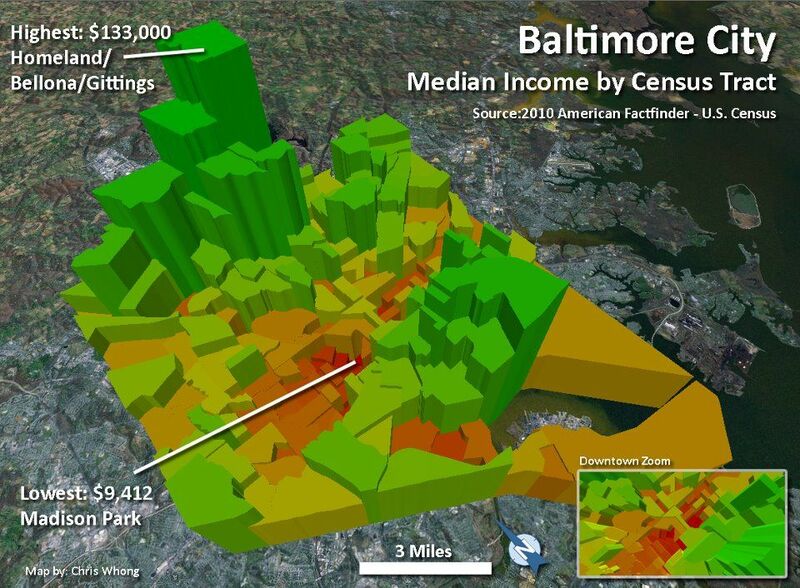 This map shows median income by census tract in Baltimore City, using 2010 census data. Each tract is both color coded and extruded (elevated) above the surface of the map based on its Median Income score. I chose not to add too much text so you can clearly see the spatial pattern jumping out at you. The Downtown communities of Locust Point, Federal Hill, Fells Point, Mount Vernon and Canton stick out in the central part of the city, and the wealthy suburban areas of Roland Park and Mount Washington form the summit of a “wealth tower” to the north. West Baltimore and East Baltimore (Hopkins) can also clearly be seen as areas of low income straddling each side of the Charles Street corridor. 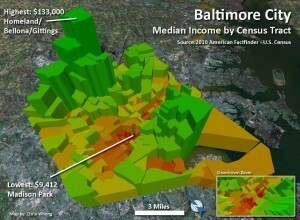 To create this map, data from the U.S. Census Bureau American Community Survey was joined with a TIGERline shape file. The extrusions and color coding were done in ESRI ArcGlobe, text and graphics were added with Adobe Photoshop. Do you have geographic data you’d like to visualize? Contact Us for a quote.